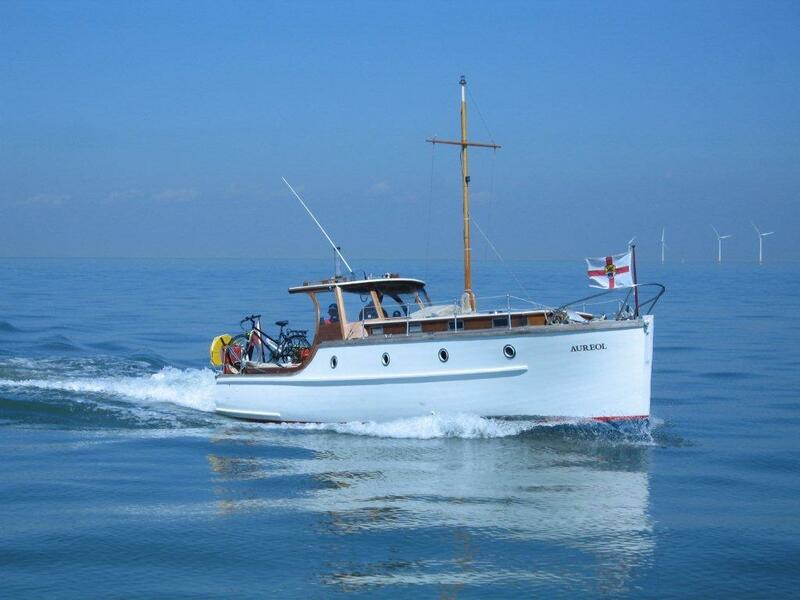 Aureol is one of the smallest and oldest surviving pre-war Ramparts Cruisers. 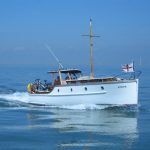 She was the first boat built by the yard in 1936 and is the same design ( a “no.8” ) as Grateful – the boat they had famously designed and built for Douglas Fairbanks Jnr in 1934. 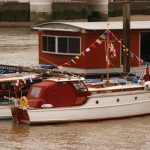 30 ft long and with a beam of 8’ 9” and a shallow draft of about 2’6’ she is primarily a river and estuary boat, and indeed has spent nearly all her life on the River Thames, and where she currently moors at a small boatyard in Weybridge, Surrey. 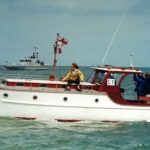 Originally built with a single Morris petrol engine, she had a so-called second or “wing” engine added on her port side in the 1950’s. Both engines have now been upgraded to modern Japanese (Kubota) diesels. The wing engine has proved very useful in our ventures down the litter-strewn Thames tideway when ropes, life jackets and milk-crates have fouled the main propeller on numerous occasions! Aureol was not her original name; she was launched as “Kitty”, then re-named “Z’ena” after the War but in the 1950’s her then owners went on a cruise to Africa on the Elder-Dempster liner SS Aureol. they were so impressed by the steamer, they re-registered Zena as Aureol. 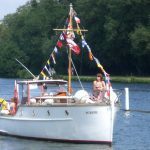 A story we only learned last year when their son left a note in Aureol’s cabin – along with some photo’s of how she looked in the 1950’s when apparently she was kept at Wootten’s boatyard in Marlow. Aureol is one of the four surviving Ramparts to have participated in the evacuation of Dunkirk in 1940, and every five years makes the commemorative cruise back to Dunkirk with all the other “Little Ships”. 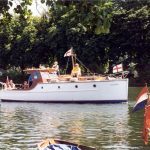 The Thames Traditional Boat Rally – or Festival – at Henley in July is another regular fixture in Aureol’s cruising calendar. The attached photographs show her at the “Trad” in 2005, shortly after her wheelhouse had been re-built (she was originally built without one at all ), and cruising past a Thames estuary wind farm on a sunny calm day in May 2010 – at least it was calm until we turned the corner around North Foreland!